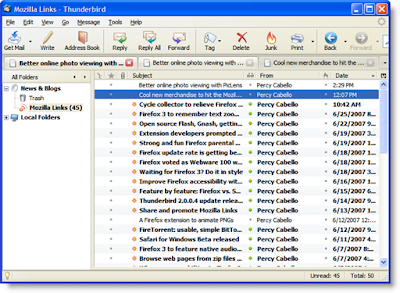 After much anticipation, it looks like Mozilla Thunderbird will finally be getting tabs. Code support for the tabbed interface has just been added to the nightly trunk build, but it isn't ready for primetime yet. Some glitches like the inability to click the close button remain. If you've used Yahoo! Mail Beta, you have some experience with tabbed browsing as it relates to email. How it works in Thunderbird (trunk build): right-click a message and select Open Message in New Tab.